Airbus has lifted its forecasts for new aircraft deliveries over the next two decades as airlines seek to meet growing demand for passenger travel and replace older generation aircraft. The Airbus 2018-2037 Global Market Forecast (GMF) published on Friday (European time) said airlines are expected to order 37,389 new aircraft between 2018 and 2037. The figure is up 7.1 per cent from the 34,900 expected new aircraft deliveries in the 2017-2036 GMF. 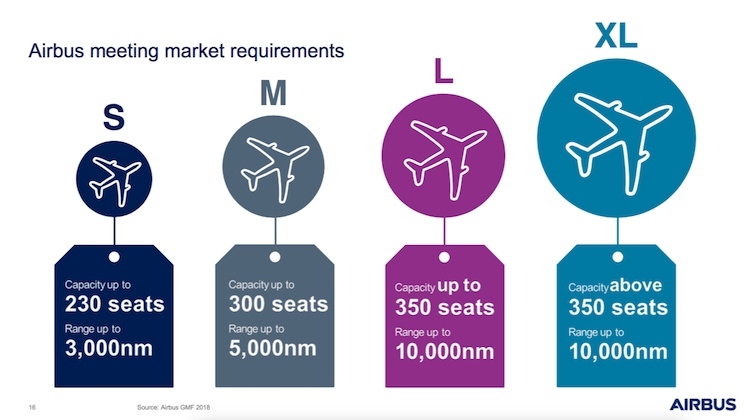 Airbus has taken a different approach to breaking down the various market segments in the 2018-2037 GMF. It has replaced categories such as single-aisle, twin-aisle and very large aircraft with four market segments – Small, Medium, Large and Extra Large. Airbus chief commercial officer Eric Schulz said in a statement the new segmentation more closely reflected the way airlines operate aircraft. 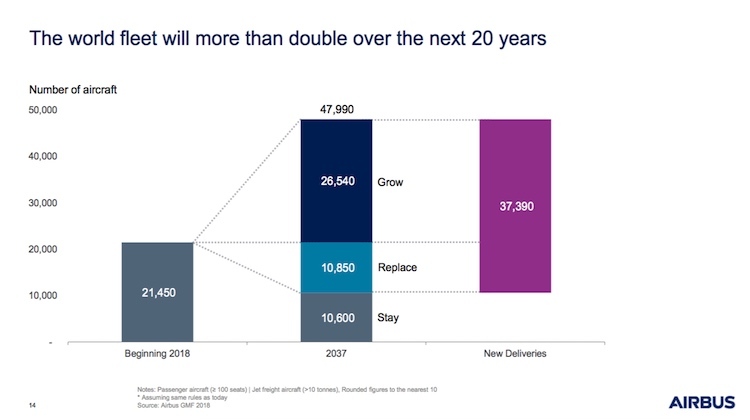 For the small aircraft segment, Airbus expects 28,550 new aircraft deliveries over the next 20 years, representing about 76 per cent of all deliveries. The medium segment will comprise 15 per cent of new deliveries, or 5,480 aircraft, while the large segment sits at 1,760 (five per cent) and the extra large segment 1,590, or four per cent. 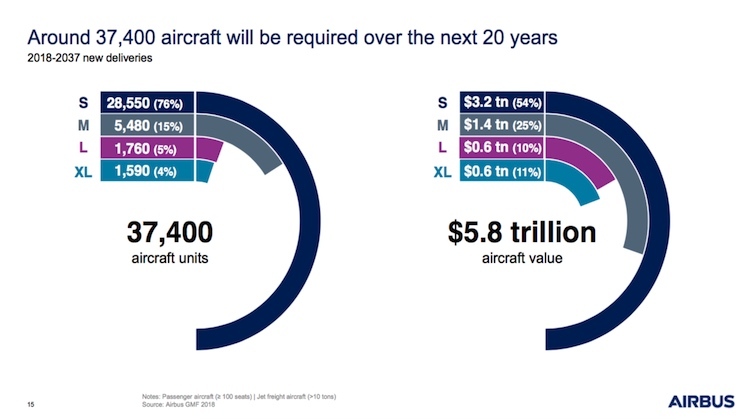 The total fleet around the world is expected to increase 47,990 aircraft by 2037, from 21,450 currently. 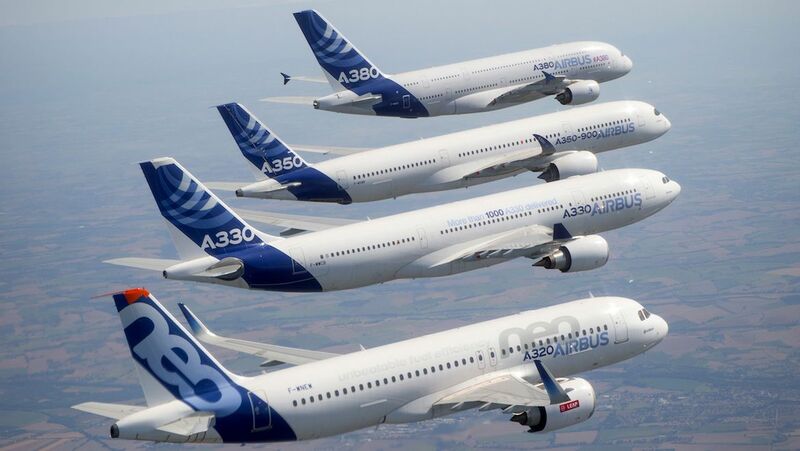 To get there, Airbus expected 26,540 aircraft to be added for growth and 10,850 aircraft will replace older models. Meanwhile, 10,600 aircraft in service today were expected to still be flying by 2037. Looking closer to home, Airbus said the Asia Pacific region, including the likes of Air New Zealand, Fiji Airways, Qantas and Virgin Australia, would have the largest number of aircraft deliveries over the next two decades at 15,895. This comprised 12,494 in the small category, 2,306 in the medium category, 617 in the large category and 478 in the extra large category.